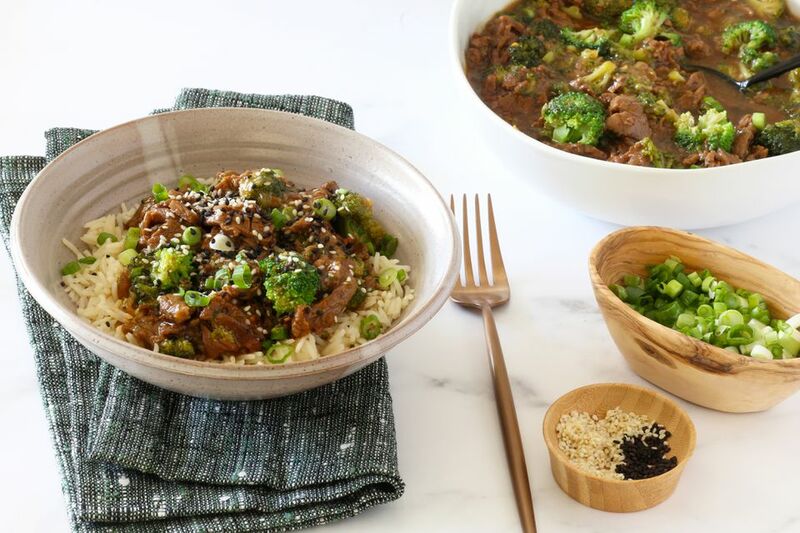 Use your Instant Pot pressure cooker to make a beef and broccoli that rivals the one from a restaurant. Fresh broccoli florets and tender strips of steak cook to perfection in an Asian-style ginger and garlic sauce. This delicious dish has the potential to become a dinnertime staple. Don't be surprised if the flavor surpasses your favorite takeout version of the dish! Feel free to play with the heat level, using more or less sambal chili sauce, or adding extra brown sugar if you prefer a sweeter sauce. To give this dish a party-ready presentation, serve the beef and broccoli over hot cooked rice and garnish servings with sesame seeds and sliced green onions. Add the cooking oil and 1 teaspoon of the sesame oil to the Instant Pot and choose the sauté setting. Use the adjust button to select the highest sauté setting. When the oil is hot, add the beef. Cook, turning frequently until browned, about 2 to 3 minutes. Add the garlic and ginger and sauté for 1 minute longer. Cancel the sauté setting. Add the remaining sesame oil, beef stock, soy sauce, oyster sauce, brown sugar, and chili paste to the beef mixture. Stir to combine the ingredients. Lock the Instant Pot lid in place. Make sure the vent knob is pointing to "sealing." Choose the manual button and select high pressure for 8 minutes. Meanwhile, put the broccoli in a saucepan with about 1/2 cup of water. Cover the pot and bring to a boil. Reduce the heat to low and steam about 3 minutes, or just until it is tender. Alternatively, put the broccoli in a microwave-safe bowl with 1/3 cup of water. Cover the bowl with plastic wrap and microwave on high for about 2 1/2 minutes, or until it is crisp-tender. Transfer the broccoli to a colander to drain and rinse it with cold water to stop the cooking. In a small bowl or cup, combine the cornstarch with the cold water. Mix until smooth and lump-free. When the time is up, release the pressure manually. The hot steam will release quickly, so use a spoon handle or oven mitt to switch the knob to "venting." Cancel the warm setting and set it on sauté. Add the drained broccoli and cornstarch to the pot and cook, stirring, for about 1 minute or until the sauce is thick and the broccoli is hot. Transfer the beef and broccoli to a serving bowl and sprinkle with some of the green onions. Serve with hot cooked rice and offer sesame seeds and the remaining sliced green onions on the side. Enjoy! For easy slicing, put the steak in the freezer for about 30 minutes. Partially frozen beef is much easier to cut through. Chop the broccoli florets into uniform pieces and avoid overcooking. The broccoli should be bright green and just tender-crisp. If you don't use ginger often, consider freezing the roots in 1-inch portions. You'll have fresh ginger whenever you need it. The total cooking time is about 15 minutes (this includes steaming the broccoli), but be sure to factor in about 7 to 10 minutes for the pressure to build. If you don't have sambal, add about 1/2 to 1 teaspoon of crushed red pepper flakes or Sriracha sauce (to taste). Replace the oyster sauce with a combination of 1 1/2 tablespoons of low-sodium soy sauce with 1 1/2 tablespoons of hoisin sauce. Keto-friendly arrowroot can be used to replace the cornstarch. Use the same amount of arrowroot powder.